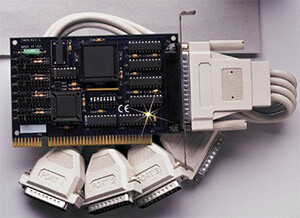 The OMG-VERSACOMM4-EX provides the PC with four RS-232 Async links to data collection equipment and other devices. This product features extended interrupt support, individually selectable or sharable interrupts, and an onboard interrupt status port for maximum Windows flexibility. Windows XP/Vista/7 drivers are included. The drivers provide IRQ sharing, advanced UART support and serial diagnostic utilities.